Last Sunday I visited the Celts exhibition at the British Museum. I'm not even going to attempt to say anything original or penetrating about it, but see it if you can. 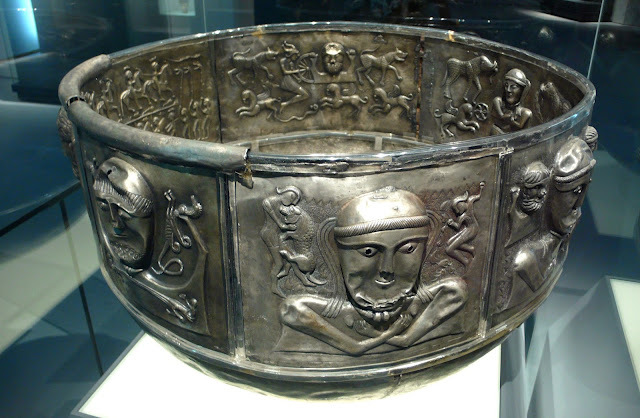 It contains a prodigious number of show-stopping artefacts, such as the Gundestrup Cauldron (above); it's made of silver, dates from about 150 BCE - 50 BCE, and is much bigger and even more impressive than the photo suggests. I can't say that I liked the dreadful new-agey music that's piped throughout the exhibition. I felt that at any moment I was about to be accosted by someone offering me a massage or to realign my chakras. And although it wasn't really all that crowded for a Sunday afternoon, you still had to queue to see many of the display cases; everyone else has got just as much right to see the exhibits as I have, but nevertheless I'm afraid to say that my not very latent inner misanthropist was roused. You have to acquire a degree of cunning, guile and ruthlessness in these circumstances. Faint heart never won a fair view of the exhibits. You have to hover until you see a space about to open up, then dive in, passive-aggressive elbows going full tilt. 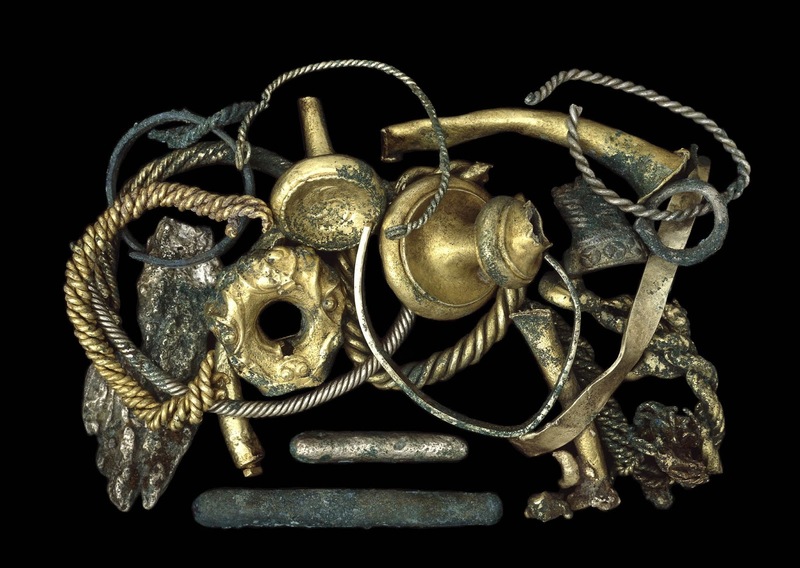 One of my favourite display cases contains a number of broken torcs (the picture above is a stock photo from the British Museum's archives, and doesn't necessarily show the same torcs, nor does it show their arrangement in the exhibition, but it gives some idea of what the display looks like). If I remember correctly (they're not illustrated in the catalogue) they're from the Snettisham (Norfolk) hoard, and date from about 350 - 50 BCE. They were probably broken deliberately and ritually to signify their withdrawal from the everyday world and to make them suitable for the gods or ancestors, and buried as offerings. Or they belonged to a metalworker, who intended to melt them down and make them into new objects. I like the fact that we don't know, that the truth could be mystical or purely practical. As beautiful and awe-inspiring as the many intact, or largely intact object are, I find these fragments far more poignant and moving. I feel more affinity with the people who made and damaged these torcs than I do with the smiths of the Cauldron, for example. The misshapen and snapped metal speaks of human frailty, of people like you and me going about their daily business, trying to make sense of a puzzling and sometimes hostile world.